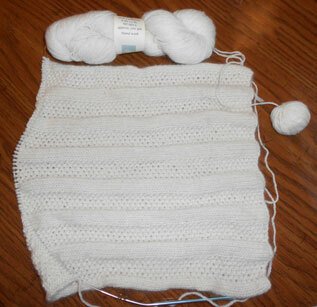 This work in progress is a lovely White Cashmere shawl. It has been stored with several other projects. I purchased the cashmere at the Stitches East marketplace when it was in Baltimore at least five years ago. The cashmere is from Cape Cod Fibers in Massachusetts. It is 4 ply 100% Cashmere and is extremely soft. I’m knitting it on a Size 5 needle with a gauge of 6 stitches to the inch. My shawl currently measures a little more than 12 inches long so I have a lot of knitting to do before it’s finished. The pattern that I chose consists of a columns of stockinette stitch and columns of seed stitch. The pattern holds my attention but the yarn is so soft that I seem to get drowsy while working with it. This will be a classic when it’s finished but who knows when that will be.